away from the noise, pollution, dust and the mad rush of hi-tech metros. Although it was quite hot in Udaipur as well but the climate was bearable, in fact a bit pleasant, because of the cooling effect of the charming lakes. In Udaipur, my lungs loved the air. The city sounded uncannily quiet. What could be more interesting activity than shopping to explore the ancient culture and traditions of the Rajputs dipped in vibrant colours? 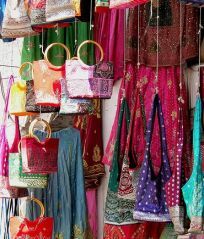 I got to know that Udaipur has countless shops and many interesting local crafts. My mother told me on phone that the city is also famous for producing furniture covered with silver and inlaid with mother of pearl and bone. 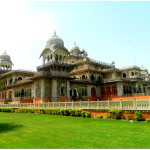 It was certainly a big deal to carry that huge furniture to my native place from Udaipur. But I could buy some small artifacts and traditional handicraft items. 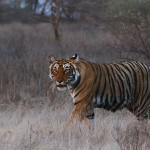 Therefore, I started my hunt from the stalls at the Lake Palace Road. I found a umber of traditional Rajput-Mughal-style miniature paintings there. Those were designed in a variety of mediums such as bone, paper, silk, marble, and wood. The shops next to the Rang Niwas Palace Hotel and the Jagdish Temple are also famous for such artifacts and beautiful images of Gods and Goddesses. My driver took me to ‘Hathi Pol’, which is the biggest market area of Udaipur. I bought a few exquisite items such as colorful dyed fabrics and hand printed textiles, wooden folk toys and silver jewellery for my mother and sister. The animated colors and themes painted on the wall hangings are famous all over the world, but I found them very costly. Clock Tower, Chetak Circle and Bapu Bazaar are other famous market areas, which are known for the best of traditional articles and handicrafts. The best attractions of these market areas were Bandhej sarees & suits, traditional jewellery, handmade papers, painted wooden box, marble and wooden carved doors, brasswares, beadwork and precious & semi precious stones. I was surprised to see the wealth of ethnic crafts that constantly reminded me of Mewar’s royal traditions and ethnic grandeur. Rajasthali and Sadhna are two government emporiums that offer all the products under a single roof. 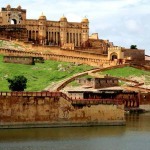 You are offered the best deals here and you can capture the most of Rajasthan in these emporiums. There is a great opportunity for bargaining also. Shopping in Udaipur was an enchanting cultural experience as I interacted with incredibly talented folk artists. «Next Post Shopping In Jaipur- An Experience High On Beauty And Quality!